Hi guys! I’ve got yet another sewing project to share with you today. Can you believe how much I’ve been sewing lately? I’ll attribute it to a lot more free time now that I switched jobs as well as being asked to test out a few new patterns. Which brings me to this particular project, which is the Bronte shirt, a brand-new pattern from Jennifer Lauren. 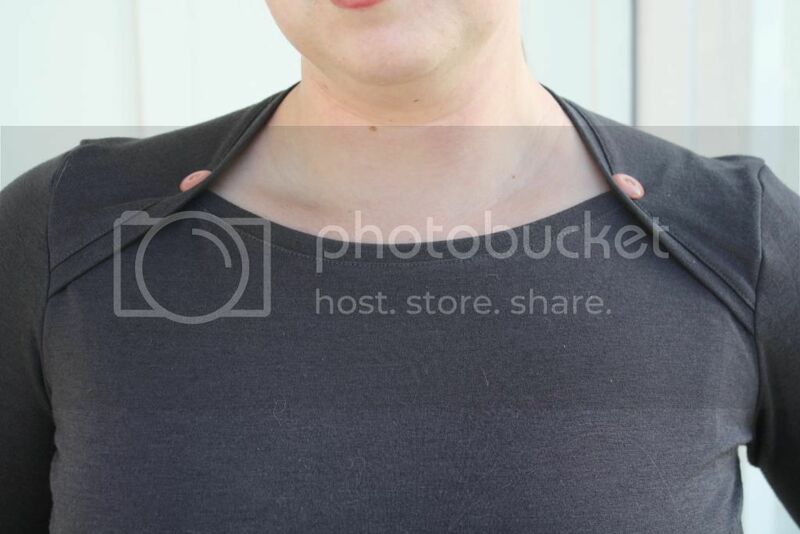 As you can see, this is a knit top with a little shoulder detail, which you could either leave plain or add some buttons or other embellishment. 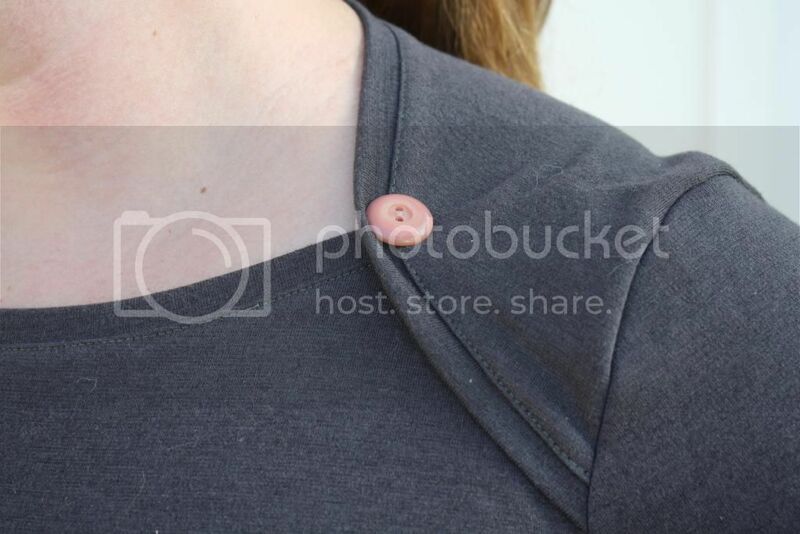 I chose to add a couple of pink vintage buttons to mine. I really like that this is something I could wear anytime with jeans. I have to admit that my handmade wardrobe is lacking in “practical” pieces like this and I’m certainly planning on making a few more. This particular project was exciting for me because it was the very first knit project I’ve sewn! I was so happy with how this one turned out that I went ahead and made the Moneta dress I’d had sitting in my sewing room but was still slightly nervous about trying to sew. And then I made two more! Don’t you love when you finally try something new and it works? I think that my experience shows that this is a great beginner pattern for sewing with knits. It’s pretty simple and it also sews up pretty quickly- it only took me about 2 hours from cutting to finishing (and I’m a pretty slow sewer, to be honest). There are lots of variations you could make by changing the length of the sleeves, adding or not adding buttons, and using contrasting colors for the binding. I did make a couple of changes from the pattern for this version. First, I lengthened the hem by about 6 inches. 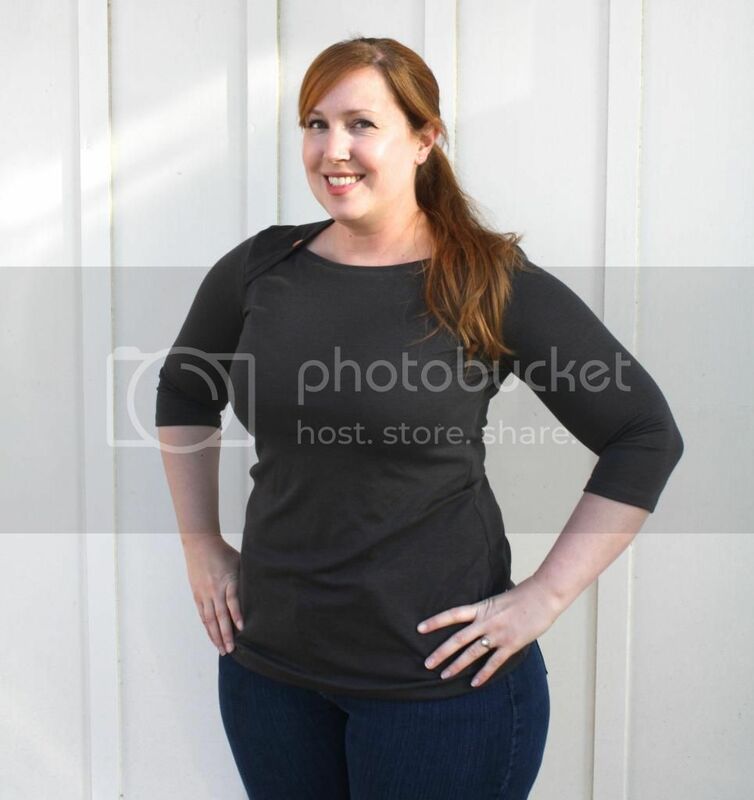 I don’t know about you, but I prefer my shirts on the longer side when wearing them with jeans to prevent any “exposure” issues when bending down or sitting. I also decided to shorten the long sleeves to a 3/4 length. I feel like when I wear long sleeves I always end up pushing them up, so I prefer 3/4 length. Thanks Jen for letting me test out your fabulous pattern and get over my fear of knits! In my case I’ve only recently been asked to test a few patterns, and I’ve always been glad to do it. I enjoy taking on a new sewing challenge while helping out a fellow online sewing community member and an entrepreneur who is trying to make a living (or at least a little extra money) following their passion for sewing and creating. I would love to do the same one day! In general, I don’t think that pattern testers usually get paid for their work, but they do receive a free copy of the pattern they test (naturally) which is a nice reward in itself. I personally don’t mind seeing pattern testing posts on other bloggers sites, especially if it is one that I’m considering buying, because I like to see it made up in different ways and on people of different shapes and sizes. I always give my honest opinion about the pattern to the designer and on my own blog and hopefully this will help everyone when creating their garments and deciding if a pattern is right for them. Anyway, that’s my opinion. What’s your take on it? ← Blogger Meetup in LA this Saturday!